nky circles serve as the written language of an alien species in the movie "Arrival." The Oscar-nominated science-fiction film "Arrival" arrives on Blu-ray today in 4K high dynamic range (HDR). Space.com recently spoke with the film's production designer about the striking visual elements of the film. "Arrival" tells the story of two scientists attempting to communicate with alien beings who arrive in massive stone spaceships at various locations around the globe. Visually, the movie embraces minimalism, rather than flashy, high-tech settings. The movie's palette is dark and earth-toned (even the spaceships are a natural material). Circles are a very important, recurring theme in "Arrival." The story explores the nature of time as a circle, and circles appear in many places throughout the film — for example, a hospital where two crucial events take place in the movie has a circular layout. Villeneuve wanted the aliens' written language to be based on circles, Vermette told a group of reporters at a news conference Friday (Feb. 10) at Paramount Studios in Los Angeles. But what exactly those circles would look like stumped them. Every idea they came up with seemed too artificial, Vermette said. Even someone who couldn't read the language would very likely recognize the symbols as a means of delivering information. "We wanted to have something that was aesthetically pleasing, and that [viewers] could not at first know that it's a language or not," Vermette said." Humans work to interpret the inky written language of an alien species in the movie "Arrival." The symbols all start with a black circle, which then has loose tendrils and splotches branching out from the solid ring. The splotches look as though they were made by hand using an ink pen. (The aliens in the movie squirt the ink out of their bodies, sort of like a squid or an octopus.). In the film, the scientists discover that the circles typically represent a full statement, but the statement can be broken up into words. The protagonists eventually create an index of these inky words, so they can write messages to the aliens. In reality, Vermette said he and Villeneuve had their own index of about 100 alien words made in the style that Bertrand designed. As the project moved forward, the pair consulted with real-world linguists and archaeologists to help refine the design. Seth Shostak, a scientist at the SETI Institute (SETI stands for search for extraterrestrial intelligence), said some scientists have thought about how humans might translate alien languages. Linguists have shown that there are many redundancies in human languages, which is part of how we are able to comprehend spoken languages at all, Shostak said. For example, studies have shown that if all the vowels are removed from a written document, a person (who has never seen the document in its complete form) can still read most of the words. "It turns out there's a mathematical law for the redundancy of any language," Shostak said. "And you can apply that to the sounds made by dolphins or even other critters, like ants. And they follow this same mathematical law. So that suggests that it's not just noise [the animals are making], there's actually a language there. So I think that if you picked up a signal coming from aliens, you'd do the same thing." 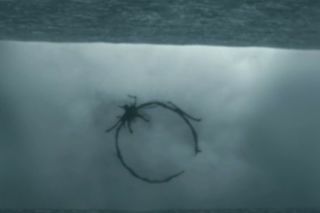 The "Arrival" Blu-ray is available now, and comes with a bonus disk that includes five featurettes about the film: "Xenolinguistics: Understanding 'Arrival'"; "Acoustic Signatures: The Sound Design"; "Eternal Recurrence: The Score"; "Nonlinear Thinking: The Editorial Process"; and "Principles of Time, Memory & Language."